Chef David Perlick has experienced success with Montarra Grill, in Algonquin, and is now transferring his culinary magic to M Supper Club, in Crystal Lake. During its 13 years in business, Algonquin-based Montarra Grill, 1491 S. Randall Road, has won the allegiance of diners for its creative take on contemporary American cuisine. 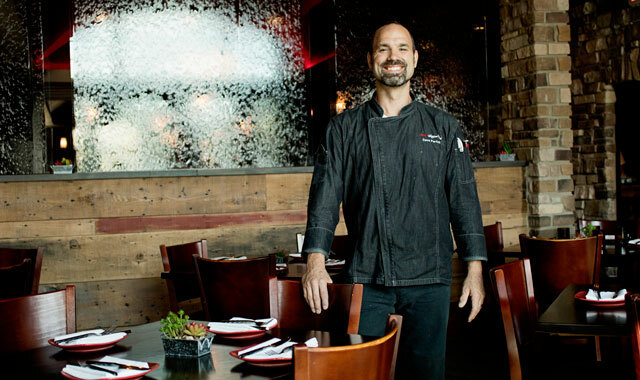 Executive Chef-owner David Perlick has created a menu that meets – and often exceeds – the expectations of its clientele. Now Perlick and his business partners are attempting to transfer some of the culinary magic to M Supper Club, a new restaurant they opened in mid-May at 394 W. Virginia St., in Crystal Lake. “We were poised for growth a year ago and looking for a way to move in a new direction,” says Perlick. As its name indicates, M Supper Club takes inspiration from the classic supper club, a concept that is, in many ways, a Wisconsin phenomenon. That state is home to about 400 such restaurants, but the ranks are shrinking as operators retire and the industry evolves. In exchange for their loyalty, more and more diners now demand greater variety, fresher flavors and a more unique dining experience – all concepts baked into Montarra Grill. “I think we will see a resurgence of supper clubs,” Perlick says. At M Supper Club, the strategy for success is to create a classic dish and add a modern touch. Among the most popular dishes are praline-crusted Lake Ontario walleye, Chesapeake Oysters Rockefeller and Steak Diane. M Supper Club has also become a destination restaurant for Black Angus filet mignon, skirt steak and dry spiced rubbed prime rib. Shrimp de Jonghe, a venerable Chicago appetizer, gets star treatment with a dose of premium-grade Pedro Ximenez sherry. Diners may also choose a daily special. One night it might be shepherd’s pie with a creme fraiche potato gratin. On Thursday a two-pound turkey leg confit takes the limelight, followed by fish Friday and prime rib Saturday. M Supper Club has a standing food challenge, and it’s not for the faint-hearted. Eat a four-pound, center-cut bone-in rib-eye and the $179 meal is free. Then again, the “old 96er,” as it’s called, is also available as a family-style meal to share, with no challenge. In keeping with the supper club theme, diners start their meal with an ever-changing relish tray stocked with the likes of pickled beets, carrots, olives and a house-made pimento cheese dip. There’s also fresh bread from a local supplier. The bar carries six beers on tap with about 30 to 40 artisanal beers in bottles and cans. Most wines in the 30-bottle wine cellar can be had for $40 and under. For a blast from the past, customers can order a Brandy Alexander, Grasshopper, Pink Squirrels or other favorite cocktails mixed like “boozy shakes,” rather than a drink on the rocks. Live entertainment enlivens the place on Fridays starting at 8 p.m.
Reservations are accepted, and there’s semi-private seating for about 165, with 40 additional seats on a seasonal patio. Prior to M Supper Club’s debut, the interior underwent some cosmetic changes: 2,000 square feet of reclaimed Illinois barn wood were incorporated into the decor and a stone waterfall was installed, separating the bar and dining room. Vintage photos from Crystal Lake and environs during the 1800s were inlaid in the bar. M Supper Club is open Tuesday through Sunday from 4 p.m until closing, as is Montarra Grill, which is still going strong. This entry was posted on Tuesday, September 12th, 2017 at 12:00 pm	and is filed under Dining Guide, Top Posts. You can follow any responses to this entry through the RSS 2.0 feed. Both comments and pings are currently closed.